So what factors should CDOs look for to determine if the headless CMS architecture is agile enough to join the digital agenda? Below are 5 key questions to consider in your selection. “Ease of integration among front-end components” was chosen as the most important characteristic when selecting a solution, as determined by a Forrester survey among digital experience professionals . A major draw of headless CMS is that you aren’t locked into a certain solutions, and this should apply to the front-end frameworks as well. Ensuring that the CMS can work with multiple frameworks - React, Angular, Ember, Vue, etc - helps you in two fold. One, you know the CMS is built to adapt to whatever app/screen/touchpoint comes next. Two, you open up the pool of talent and can entice top developers who want to work and experiment with the latest frameworks. As companies put more focus on a relevant customer experience, content delivery needs data from third party tools, such as Marketing Automation and Customer Relationship Management (CRM) systems, and the CMS you chose needs the APIs to do so (more on that below). All headless CMSs deliver content separate from presentation, but marketing-friendly solutions also deliver content orientation via APIs. When it comes to previewing within the CMS, an API can wrap each component in meta-data to show where is begins and ends. 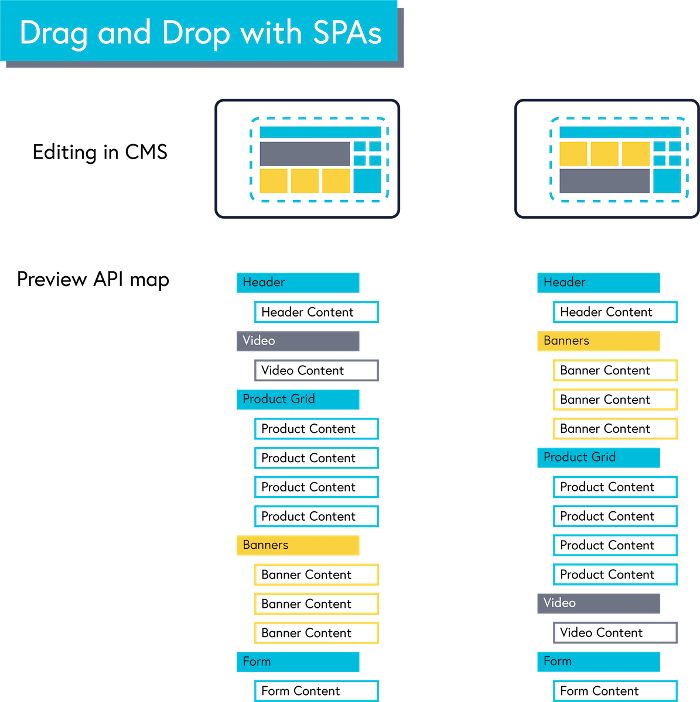 These meta-data tags create a map that your front-end framework, such as an SPA, can use to determine the order of components and the content that goes in them. The meta-data tags and Preview API also enables WYSIWYG editing. If you drag a component into a new place in the preview, the API creates a new map. The preview lets you see how that new map will be rendered by the front-end framework - giving you full confidence to push “publish”. 52% of digital leaders cite lack of access to customer data as a top challenge to maturing personalization initiatives, according to a July 2018 Forrester Report . Choose an extensible CMS with APIs that can imbibe 3rd party data (CRM, DAM, Marketing Automation, etc) and use the combined data to feed personalization efforts. With the proliferation of digital channels, this personalization needs to happen at the core of the experience - the CMS - as opposed to each front-end application handling personalization in a data silo. To do this, a CMS needs to have native, component-based personalization that occurs on the server-side. That way, relevant content is determined by the CMS before it’s sent to the front-end via the API map mentioned above. Every channel can pull from - and contribute to - the same pool of data and your visitors get a consistently relevant experience across every interaction. Combined, the capabilities of an agile headless CMS not only get your first project up and running quickly. Content and logic can be reused across multiple front-end frameworks, traditional server-side sites, or a hybrid combination of delivery methods. 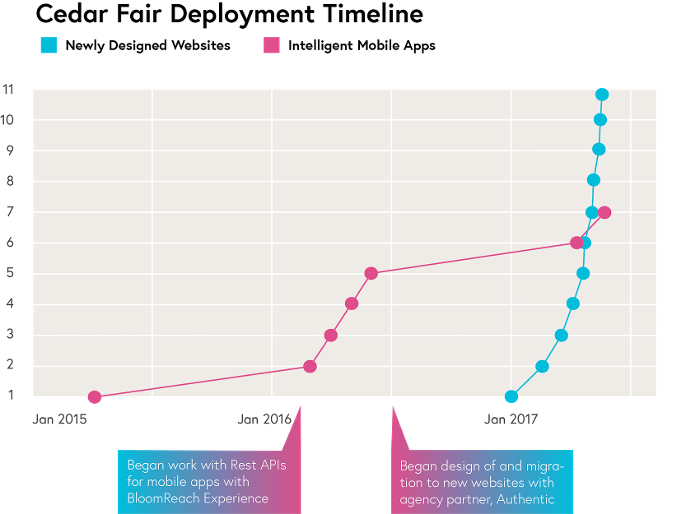 This reusability allows you to scale the experience - across touchpoints, regions, brands, etc. 1. Grannan M, Bonde A, Schadler T, et al. Forrester Research. Coming Soon: Agile Content Curation And Orchestration Will Redefine CMS. 15 November 2018. 2. Grannan M, Gill M, Chirokas M, et al. Forrester Research. The State Of DX 2018: Priorities Thwarted By Legacy Foundations. 19 July 2018.